Rocket News pumps out to NHS classrooms every Tuesday, and behind the scenes senior Will Clark functions as the scriptwriter and producer. Clark explained that he is sometimes shy as a mouse, enjoying his role in the background versus the limelight of broadcast. Dressed as casual as a thief making his first lift, Clark looks to blend into the student body. It is his enthusiasm for life and sense of obligation to be the pulse of NHS that forces him to volunteer for task of scriptwriter, which is no small time commitment. In his junior year, Clark wanted to join a club with two friends Miranda Kruger-Olsen and Ben Stern (both class of 2018), the main reporters for Rocket News. Every Tuesday students see a product of news, but usually the team starts next week’s edition the previous Tuesday, with script writing. He explained how writing the script is as tough as nails. 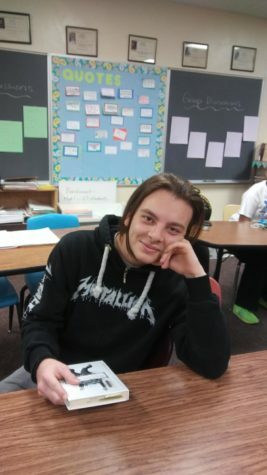 Clark is involved with DECA as well; he said that he likes both extracurriculars for different reasons. He likes the broadcasting aspect of Rocket News; Clark also is looking into business in college. Helping him through his are many friends like Evan Miracle and some of his teachers like Mr. Ben McDonald. Clark is interested in business programs with UW-Madison, but he has looked other colleges. Looking through the news stories, Clark discovered that a limited amount of content exists. The cost of not having many news stories was a shorter episode of Rocket News. As well some of the segments were cut short because the stories lacked quality. Because of the lack of quality in recent weeks, New Rocket News has been in the limelight on YouTube because of the funny on-set antics. Clark complemented the satire. Clark did encourage the student body to stay tuned as the quality of the news segments are improving. More news stories are being reported and the quality of the interviews are going up.